Electro-sound lymphatic drainage therapy is a gentle, light touch non-invasive technique to stimulate the proper flow and drainage of the lymphatic system. What Health Conditions may be improved with Electro Lymphatic drainage? 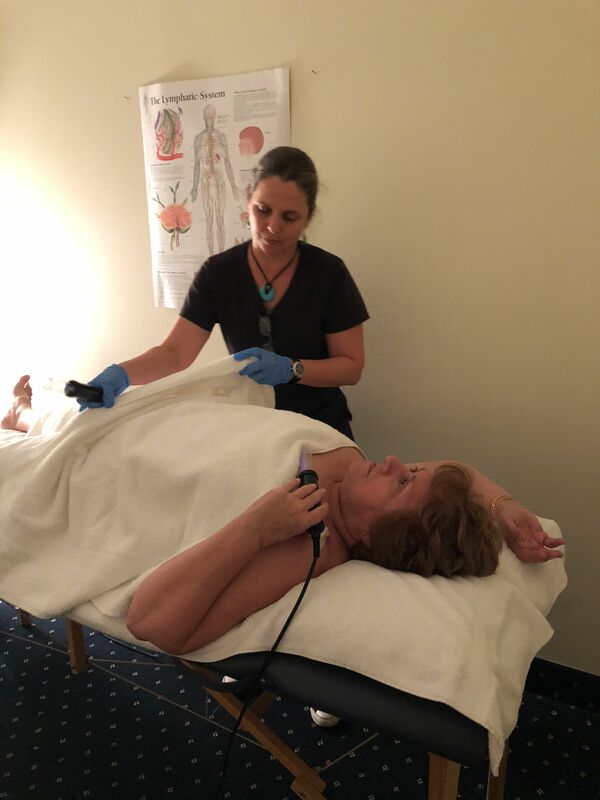 Electro-Lymphatic Therapy is a gentle, light touch non-invasive technique that offers qualified therapists a natural complement to their existing healthcare protocols. As a practitioner I have witnessed over the last 17 years the benefit of this therapy on clients with minor to major health challenges. When implementing this type of therapy, one can expect better absorption of nutriceuticals and medications which will decrease the dosages needed. This type of lymphatic therapy (electro-lymphatic therapy featuring the Rightway XP2) is much more effective than manual therapy. This therapy also can provide relief from chronic inflammation and pre- and post-surgical applications and can be used for cosmetic applications such as mastoptosis (sagging), scars and traumas. The physiology and physiopathology of the lymphatic system was slowly unraveled over time by a group of scientists interested in this mysterious fluid. While medical schools only provide very basic training concerning this body system, the critical function of the lymphatic system is now more readily acknowledged as a means to improve our overall health and well-being. The lymphatic system absorbs fluid, macromolecules, microorganisms , toxins, waste products and foreign substances from the interstitial tissue. Numerous substances (electrolytes, proteins, hormones, toxins, debris) and immuno-competent cells (lymphocytes, macrophages) pass through the regional lymph nodes, where this fluid is filtered, purified and concentrated. The lymphatic flow can stagnate for many reasons, such as swelling, chronic inflammation , lack of physical activity, stress, fatigue, emotional shock, age, and poorly fitted under garments worn for an excessive amount of time. When lymphatic circulation slows down, the regeneration of cells becomes less effective. This condition allows toxins and proteins to accumulate around the cells, causing cellular oxygenation to decrease and tissue regeneration to diminish. Electro-lymphatic practitioners can facilitate nature by stimulating the natural peristaltic contractions of the layers of muscles located along the lymphatic pathways also known as lymphangions. Stagnating fluids, toxins and wastes will be drained through the flow of lymph; therefore this type of circulation will accelerate all healing processes from the deep to the superficial lymphatic system. During this passage the body will generate production of more lymphocytes to reinforce immune response and accelerate contact antibodies/ foreign substances. Advanced practitioneFS of-Etectro-lymphatic therapy are trained to interact with the fluids at different levels, from the superficial cutaneous circulation to the mucosa, muscles, tendons and viscera. They are also able to perform Lymphatic Mapping and rerouting techniques to achieve maximum drainage for their client. Circulation of lymph, blood capillaries, veins, interstitial liquids and cerebrospinal and synovial fluids (in-directly) is activated. This action helps to reroute stagnant fluid in the skin (i.e., edema, primary and secondary lymphedema), mucosa, muscles, viscera, joints, cranial sutures, periosteum, chambers of the eyes and cochlea. Toxins are removed, making lymphatic drainage especially effective in tissue regeneration. Scars, stretch marks, wrinkles and fracture, or surgical-incision sites, are improved Macromolecules (proteins) are drained, which helps to eliminate protein-rich fluid from the extracellular tissues and aid the reabsorption of edema. Fats are evacuated through lymphatic vessels. These vessels are located in virtually every area of the body where fats may accumulate. The functioning of the immune system is stimulated through increased lymph flow. The additional flow carries more antigens to the lymph nodes, thereby increasing antibody/antigen contact. This has been found to help with chronic or subacute inflammatory processes -- chronic fatigue syndrome, autoimmune disease, bronchitis, sinusitis, amygdalitis, tonsillitis, laryngitis, arthritis, acne and eczema. The functioning of the parasympathetic system is bolstered and sympathetic tone is diminished with stimulation of the lymphatics -- the "fight or flight" response. This can be very helpful in dealing with stress, depression and sleeping disorders. Chronic pain is reduced as the drainage alleviates tissue-fluid stagnation and possibly inhibits nociceptors (pain receptors). Voluntary and involuntary muscle spasms are reduced, proving helpful in cases of constipation and other muscle-related maladies. The practitioner should also add a micro-mineral supplement such as Refuel to their clients' protocol if they are having muscle spasms. to doctor immediately. Ifthere are any doubts, practitioners need to work under the guidance of a physician. therapist should not risk tampering with the clot. Major cardiac problems including acute angina pectoris and coronary thrombosis (heart attack). Lymphatic techniques may increase the cardiac load. Only advanced therapists are allowed to work with cardiac patients. Hemorrhage (bleeding). The therapist should be absolutely sure the bleeding has stopped before draining. You can, however, drain the same day to reduce hematoma. Malignant ailments such as an undiagnosed lump. At the beginning of the 20th century, people were afraid of the possibility of provoking metastasis in cancer that was either evolving or not under medical supervision. A few studies have been made comparing groups of cancer patients treated with lymph drainage vs. untreated control groups. The results showed no increase in complications or metastasis in the treated group. At this date, no rigorous scientific study has demonstrated the spread or severity of cancer was aggravated by lymph drainage. This notion is also shared by consensus of the International Society of Lymphology (1995). Advanced therapists are allowed to work on malignant cases however they should be working with the client's oncologist or other healthcare specialist. The therapist must bear in mind that only a physician is qualified to make a diagnosis and prescribe a treatment for any of the above described disorders. Lymphatic practitioners are not permitted to diagnose. Individuals with Pace Makers are contraindicated and cannot receive electro lymphatic therapy. They can however receive manual lymphatic therapy. In the 1940's Edgar Cayce developed an inert gas ionization instrument (IGII(tm)) known as the Violet Ray using the ionization of the inert gas Argon. Edgar's instrument used a coil invented by Nicola Tesla (Tesla Coil) to produce a safe high voltage electrostatic discharge (without the dangerous current) producing enough voltage to ionize the argon in a glass tube. Edgar's Violet Ray attributed many health benefits to his device and the Violet Ray is still in use and manufactured today. We refer to this type technology as (IGII(tm) or Inert Gas Ionization Instruments) in our discussion on this technology. of, mention of, or any claims regarding the use of, this technology. Disclaimer on Rife and FDA: For more information-about the works of Royal Rife, and the FDA we urge you to examine the entire story from both perspectives and it's not the purpose of this discussion to validate or argue either's position on this topic. appeared on the market place all of which showing conclusive results with increasing the lymphatic flow especially with the adaptation of lymphatic decongestive therapy. In 2007, Rightway Enterprises, LLC manufacturer of the Lymph Drainage XP(tm) family of instruments contracted Sky-David (who has been involved in the technology for over 30 years, a biologist, and PhD in Physical Therapy) to develop a newer and more advanced version of the existing technology that was currently being offered through other manufacturers and engineers. As part of the criteria, and based on Sky's ongoing research in this photobiology field, Rightway focused on the use of Xenon, Argon and Krypton for the inert gases used in the transmission heads and tested several pressure variations within the glass bulb for maximum delivery and biological compatibility. For a great reference on the discussion of Xenon and Krypton in human tissue you can read the book, Einstein Doesn't Work Here Anymore by Maurice B. Cooke. Although controversial, (as the case with most things these days) in this book there is a lot of research regarding the biological compatibility of Xenon with human tissue and Krypton as a catalyst. The most significant change was in the proprietary circuitry scheme of the Lymph Drainage XP(tm) family of instruments which utilize a randomized complex signal envelope with emphasis on the attack and delivery of the signal transmitted to the transmission heads. With the more prominent attack wave the vibration produced can be compared to ajack hammer busting up concrete (fibrotic and trapped proteins) with the added flexibility of tuning down the attack for a more subtle sweep (superficial). This complex circuitry scheme is responsible for the overall effectiveness of the ability to move stagnate or fibrotic lymph in the lymph system without overstressing the lymph vessels. Lymph vessels can be differentiated between lymph capillaries, pre collectors, lymph collectors, and lymphatic trunks. How does an Inert Gas Ionization Instrument work on the body? Inert elements have their outer electron shell filled so they rarely interact molecularly with any other element thus; they remain in their elemental state. This is what gives them their unique properties (inert). The Inert Gas Ionization Instruments (IGII) high voltage low current discharge excites the electrons causing these electrons to jump into an outer orbit. When this occurs the atom will return to its ground state. This return to stability results in the release of radiant energy through the transmission head. This radiant energy is given off through a combination of light, sound vibrations and through the flow of electrons (also known as ionization) which is discharged through the body tissue and lymph. This effect is far more biologically compatible than other transmission methods such as low voltage metal plate transmission of an ultra sound device. The reason for this is that inert elements create a buffering effect in the energy exchange rather than the direct RF transmission created by the actual circuitry of the instrument. between themselves then releasing the stagnate lymph. This allows the lymph vessels to release the excess blocked , stagnate or retained fluid and to flow out into its normal filtration and reabsorption channels. As we can see the use of a Inert Gas Ionization Instrument in conjunction with the proper therapeutic techniques can provide results far beyond that of manual lymph manipulation or use of tight fitting garments by addressing the trapped and sticky proteins directly.